Manchester Parents Group meets with Sparkle.org.uk. Walk down Oxford Road and you might not notice the Joyce Layland Centre, a non-descript building tucked behind the Eighth Day Café. Now run by the Proud Trust, and a safe and welcoming community space for LGBT+ people of all persuasions, races, gender identities and beliefs, the story of the woman and civil rights campaigner who gave her name to the centre is both extraordinary and inspiring. In 1986 Cath, the mother of a young gay son who had recently come out to her, spoke to Joyce on a helpline offering advice and support to the parents of gay children. 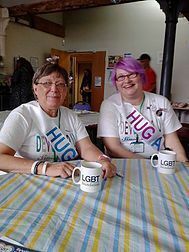 Joyce told her about the work she did at a local Gay Youth Group and soon Cath had joined her in supporting young gay teenagers and lesbians who asked for help coming out to their families, sometimes speaking to the parents to reassure them about their children’s sexuality. Read the rest of the article below.